A wall switch is a mechanical device with moving parts; it gets thousands of uses over the course of its lifespan. Switches eventually wear out and go bad, and the first sign of trouble is when it behaves in a fashion that is abnormal in any way. For example, if there's an audible crackle, snap, or popping sound when you flip the lever, then it's pretty clear that your switch is defective and it's time to replace it. Some other warning signs are a little more subtle, and some are even more obvious. Here are some of the most common signs of trouble. You've likely had this experience: you flip a light switch on, and it takes a moment for the light to go on. This usually indicates that the metal parts inside the switch are wearing out and that its contacts are failing to make the connections needed to complete the electrical path and allow the light to illuminate. Sometimes (not always) this symptom occurs at the same time you notice that the switch lever has loosened and has lost its "snap" when you flip it. Even if this happens only occasionally, it's still time to replace the switch. It is also possible that the light fixture has loose connections or a short circuit that causes intermittent failure, so if the problem persists after you've replaced the switch, have a look at the light fixture next. It's not uncommon to see a small spark coming from inside a switch when you turn it off. This is normal in most cases, and it doesn't indicate a problem. It's caused by a load arc that occurs when the electricity jumps between the contacts as they pull away from each other. It stops as soon as the contacts are far enough apart. That said, a large spark or a spark with that makes an audible noise can indicate a faulty light switch. But if the sparking causes smoking, or if you notice scorch marks on the cover plate or switch toggle, then it is time to replace the switch. 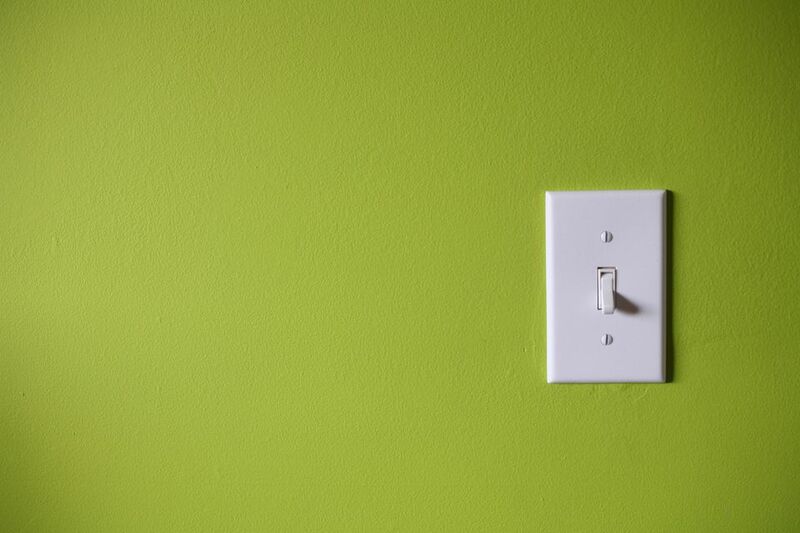 Faulty light switches can make a variety of electrical sound effects, but most can be described with one of the following words: clicking, sizzling, popping, or buzzing. Sometimes this can be caused by loose wire connections, so make sure to check these. But more likely, these sounds are warning signs of a worn or defective switch. Time to replace it. However, if it's a dimmer switch that buzzes, investigate the light bulb first. The dimming effect can make some light bulbs buzz as the filament structure vibrates. Try a different type or brand of bulb, not just a new bulb of the same type. If that doesn't help, take another hard look at the switch. Often your fingers are the best detectors of a faulty light switch. If the switch toggle lever starts behaving differently—losing it's "snap" or becoming stiffer than usual—the switch is worn and should be replaced before there's trouble. A bigger warning sign is a switch that feels warmer than usual. Standard on/off switches should never feel warm to the touch; a warm or hot switch can indicate a short circuit inside the switch or a loose wire contacting the box or another part—these are serious hazards that need to be addressed. If your house has aluminum wiring, warmth can indicate even bigger problems and should be checked out by an electrician. With dimmer switches, however, it's normal for them to generate some heat that is dissipated through the face of the switch and the electrical box. Don't worry if they feel a little warm, but replace a dimmer when it feels uncomfortably hot. How High Should My Electrical Wall Switches Be? How Do Light Switches Works? How Do You Test Outlet Receptacles for Grounding With a Neon Tester? Why Are Your Light Bulbs Burning Out Early? Can a Loose Wire Trip a Circuit Breaker?